Obituary – Tefteller, Harriett “Hattie” Mildred (VanBebber) « Perry High School Alumni Association, Inc.
Normal Training ’21, Ishkadah ’20. ﻿Mrs. Harriet Mildred Tefteller, 85, Shawnee Mission, Kan., died at 2:30 a.m. Saturday at the home of her daughter, Mrs. William (June) Wurtz, Shawnee Mission. Memorial services were at 1:30 p.m. Monday at Knox Presbyterian church at Shawnee Mission. Mrs. Tefteller had willed her body to the Kansas university medical center. Mrs. Tefteller was born Oct. 19, 1889, near Perry, the daughter of Frances M. and Ila VanBebber. 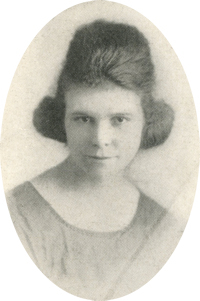 She was a registered nurse, having graduated in 1924 at Oklahoma City. She made her home with her daughter at Shawnee Mission. Survivors in addition to her daughter include two sisters, Miss Bessie VanBebber, Perry, Okla.; Miss Mary L. VanBebber, Silver Springs, Md. ; three brothers, Ralph VanBebber, Duncan, Okla.; Jack VanBebber, Oklahoma City; and Earl VanBebber, Tracy, Calif.; two grandchildren, William Wurtz Jr., Shawnee Mission; and Miss Sandra Sue Wurtz, Tulsa; and several relatives in the Perry area. She was preceded in death by her parents, three brothers, Roy VanBebber, Ray VanBebber and Glen VanBebber; and two sisters, Mrs. Bertha Shallenburg and Mrs. Dorthy Ritterbusch.